Thyme is the leaf of the Thymus plant in the mint family. There are over 350 varieties. Thyme, botanically known as Thymus vulgaris, is a perennial garden herb that has been employed since ancient times for medicinal and culinary uses. It is native to southern Europe and Mediterranean regions, and is packed with numerous health benefiting phyto-nutrients (plant derived compounds), minerals and vitamins that are essential for wellbeing. Thyme is a natural medicine that is used for treating chest and respiratory problems. It serves as an effective cure for bronchitis, coughs and chest congestion as well. The herb is highly effective on mucous membranes present in the lungs and stomach. It helps in proper digestion, mainly of the fats. The herb helps reduce symptoms of irritable bowel and colic. It helps in preventing chronic gastritis as well. 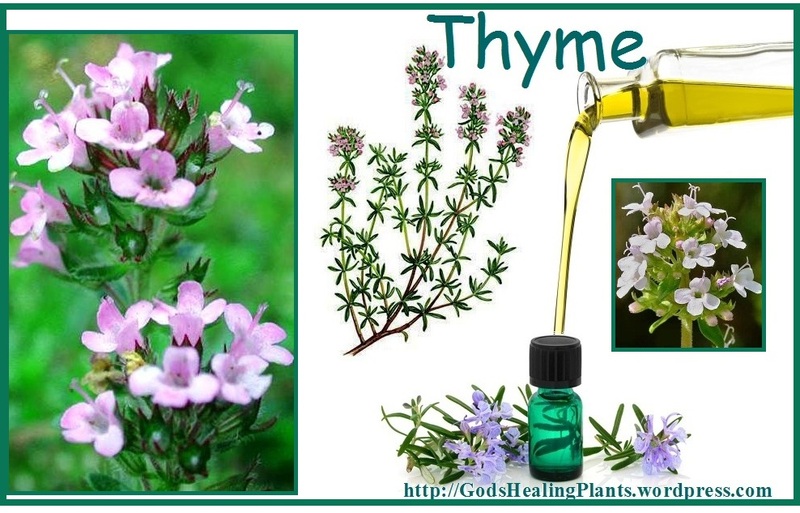 Thyme oil is extremely useful for the body and is used in toothpaste, mouthwashes and ointments. The herb makes an excellent solution for gargle and mouthwash, used for dental decay. Also, it is very effective against laryngitis, plaque formation, sore throat, mouth sores, tonsillitis and bad breath. Thyme contains thymol, which has antiseptic properties. It can be used as a poultice for insect bites, stings, mastitis and wounds. The herb is used to cure hookworm, threadworm and roundworm. It can also destroy skin parasites like the scabies and lice. It effectively fights against bacterial, fungal and viral infections. Bacillus subtilis, Escherichia coli, Staphalococcus aureus and Shingella sonnei are some of the bacteria against which thyme is very effective. Thyme consists of thymol and carvacol, which help relax the smooth vessels of the gastrointestinal tract. 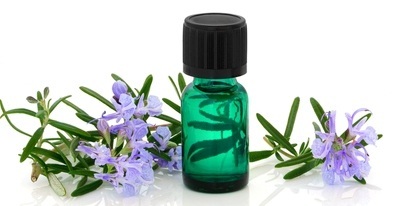 The herb can be used as a hair rinse, to prevent dandruff. It has antispasmodic qualities, which provide relief to women during menstruation. Thyme works as a tonic and stimulates the nervous system. It alleviates nervous disorders like nightmares, depression, nervous exhaustion and insomnia. It eases epilepsy, convulsions, menstrual cramps, spasm-induced coughing and diarrhea. Thyme is an excellent source of iron, manganese, and vitamin K. It is also a very good source of calcium and a good source of dietary fiber. For an in-depth nutritional profile click here: Thyme. Thyme is entirely safe to use and has no side effects. However, the essential oil of thyme may be irritating to the skin and mucous membranes, and may cause an allergic reaction. Some varieties produce a stronger reaction than others. 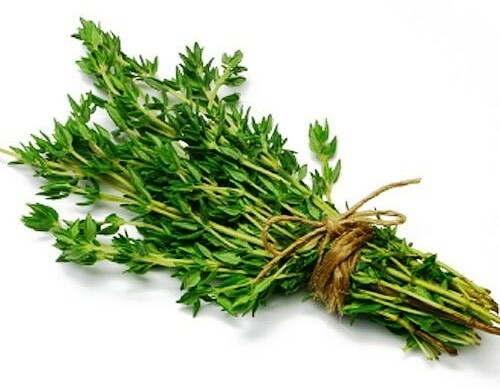 Cooking Tips – Thyme should be added to the dish towards the end of the cooking process. This is so because it tends to lose its delicate flavor when heated excessively. Thyme gives a special aroma and taste to the dishes of beans like kidney beans, black beans and pinto beans. Thyme also renders wonderful fragrance to the non-vegetarian dishes. Both fresh and dried forms of thyme herb are available in health food stores. 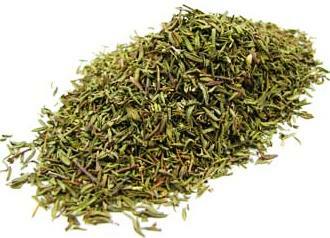 Buy fresh thyme whenever possible since it is superior in nutrients and rich in flavor. The leaves of fresh thyme should feature fresh and be a light green in color, and free from any dark spots or yellowing. Fresh thyme should be stored in the refrigerator wrapped in a slightly damp paper towel. Dried thyme can be kept in a tightly sealed glass container and stored in a cool, dark, and dry place where it will keep fresh for up to six months. 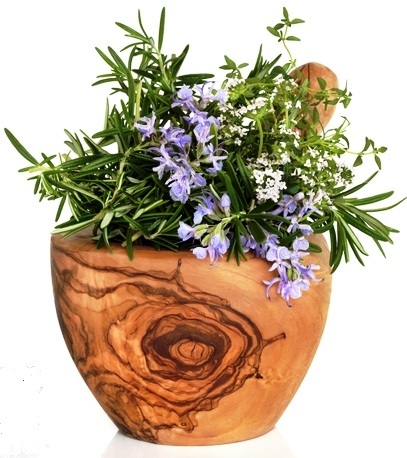 Where can you buy Whole Organic Thyme Leaf or Oil ? Here is a great source. If you are Shopping at iHerb for the first time, use my coupon code ROP246 for $5.00 off your first order. God’s Healing Plants is not licensed as, or designed to be, a healthcare facility; therefore we do not diagnose conditions, offer medical advice, or prescribe or administer medication. The nutrition and health information resented at the God’s Healing Plants Web Site is based on Scripture, research and personal experience, and is offered for educational purposes only. There can be risks involved when changing diet and lifestyle; therefore, as each guest chooses to make these types of changes, we at God’s Healing Plants cannot be held responsible or liable for any adverse effects or consequences that may result from your personal choices.